Scoodle Jam is an interactive whiteboard app that lets students connect their screens. It’s a dynamic app that has tons of uses in the classroom. Students can collaborate on projects and work together to on a variety of activities. They can access graphic organizers and different types of paper tailored for tasks designed by teachers. 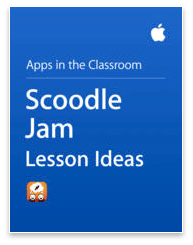 Apple has created an iBook full of lesson ideas for teachers using Scoodle Jam with their students. It includes activities for Literacy, Math, and more. Visit the iBookstore to check out the Scoodle Jam Lesson Ideas iBook or download Scoodle Jam from the App Store!